This Asian-inspired recipe from Fine Cooking was an instant success, and has entered my regular meal repertory. I now make sure to keep coconut milk in my pantry so that I always have the necessary ingredients on-hand. The meal comes together in less than an hour, so it’s perfect for weeknight dinners. The original Fine Cooking recipe calls for the marinade and sauce to be used with pork tenderloin, but I had chicken thighs in my fridge, so I decided to substitute the meat. I’ve since tried this with pork tenderloin, and also with chicken breasts. The chicken breasts were the driest of all; my first choice would be chicken thighs or the pork. But that’s what makes this recipe so great – you can use it successfully with any of these meats. So regardless of what you have in your fridge, or whatever is on sale at the grocery store, you’re on your way to a great meal. The recipe comes together very quickly and easily. Just mix all the ingredients together to make a marinade. You don’t have to let this sit long… 10 to 20 minutes is fine. But if you have more time, that’s great. 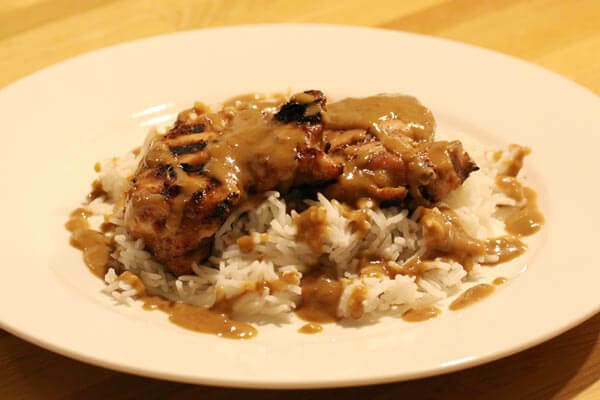 What I love about this recipe is that you don’t waste the marinade mixture. Once you put the meat on the grill, you take the marinade, add a bit of water, and put it on the stove to cook (thus killing any pathogens from the raw meat). Bring it to a boil and let it simmer, and you have a dipping sauce. Serve alongside rice.